I know this is a small thing to put on a WHOLE post, but it's FREE, so why not! This for any CVS Shoppers. Take your card up to their Coupon Center and scan it. 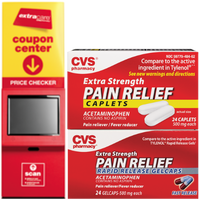 You will receive a coupon for a FREE bottle of CVS brand Acetaminophen, 24 count. You can also visit CVS's website to see the other deals they have this week.